"Our task is to help children communicate with the world using all their potential strengths and languages, and to overcome any obstacle presented by our culture." For older 3’s, 4’s, and 5’s. Student-to-educator ratio is typically 10:1. 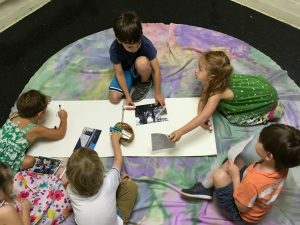 Turning Sun’s Pre-Kindergarten and Multi-Age Classes build upon the environment and curriculum from our Preschool 2 class while also focusing on kindergarten readiness. The children are greeted daily with beautiful and engaging invitations for exploration, discovery, and play. Children are asked upon arrival to find their name stone and place in the welcome basket. Invitations are offered for discovery based on the interests of the children, the class project, or other curriculum areas. Every morning, we have a morning meeting where children are invited to draw in their sketch books and greet each other through song and hellos. Turning Sun educators introduce a new material or skill, ask the children to report back findings of small groups, or discuss a topic in depth. The Pre-Kindergarten and Multi-Age Classes make their own classroom agreements to follow. Small groups are formed to explore the theories of the children and the curriculum is emergent. Like all Turning Sun classes, the Pre-Kindergarten and Multi-Age classes use the project approach. 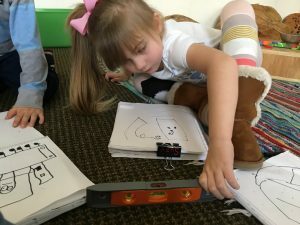 Whether the children are exploring MARTA, taking apart a toaster, making and writing their own book, exploring how a projector works, or engaging in deep play, each day is a part of the journey in their individual class project. Increased focus is also given to hand strengthening and pencil grip, drawing, counting, problem solving, developing theories, shapes, patterns and measuring. Experts are also brought in to further experiences and deepen the learning. Assessments are done twice a year by the Curriculum staff with a focus on kindergarten readiness. These results are shared with parents at Parent Teacher Conferences bi-annually. The Pre-Kindergarten and Multi-Age Classes also enjoy regular yoga classes, music classes, and garden time with TSS’s Environmental Educator. "My child is in Kindergarten and doing great. But we really miss Turning Sun and I really appreciate that he had a few precious years to fall in love with school and learn to think for himself."